These days, you can't think of Balmain without associating the brand with the Kardashian and Jenner girls. It seems as though their wardrobe is made up solely of Olivier Rousteing's design for Balmain. Many fashion insiders think that Balmain has sold out by engaging with the reality TV stars to gain popularity, but the truth is, this has always been the very essence of the brand's DNA since it was first launched in 1945. You see, Pierre Balmain was a master couturier who was more concerned with making money rather than coming up with innovations or new waves in fashion. He was never interested in developing ideas in the way that his peers like Dior, Balenciaga and Yves Saint Laurent were. And, unlike Dior and Balenciaga who kept a sense of distance from even the top customers, barely having social lives at all, Balmain met all the right people and confirmed his status as a society couturier. Balmain made sure that he had good relationships with all the Hollywood actresses he dressed such as Marlene Dietrich, Katharine Hepburn and Sophia Loren. The fact that the brand is constantly worn by these A-list actresses, meant that the brand is always in the public eye. It also meant that the brand maintains its popularity. 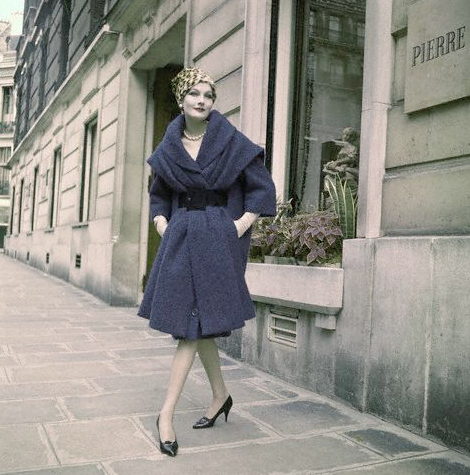 Pierre Balmain launched his label with a ready-to-wear show in 1945. It was a post-world war 2 show that was attended by American novelist Gertrude Stein and her partner Alice B Toklas. Having the two of them at the show really helped Balmain -- Stein would later write a review of the show for American Vogue, praising the French designs. You see, Balmain was the first designer to ever have an intellectual sing praises and from then on, the name of Balmain was known to everybody in Paris fashion. I love looking at archival pictures of Balmain designs. To me, Balmain understood what it takes to make a woman shine. After all, he was well-loved by the Hollywood set. Throughout his career, he was known for his glamorous evening wear, smart tailored daywear and also the nipped in the waist silhouette that's accentuated by fuller skirts. Something that not many people knew was that Pierre Balmain, despite not wanting to be an innovator, did create the "New French Style", which focused more on construction and clean lines rather than flashy, overly decorated pieces. One of my favourite looks from Pierre Balmain was an outfit he made for Queen Sirikit of Thailand in 1960s. At that point, Balmain had already been designing for the Thai Queen and was the personal couturier of the queen - having been requested for her wardrobe to be designed by Balmain since 1947. I love the mix of eastern style and Parisian embroidery. Named for the ChakriMahaPrasat Hall at the Grand Palace, Thai Chakri is a very formal gold or silver metal-thread brocade evening dress. The style features a skirt with a front pleat and an attached traditional Thai shoulder cloth. It is often embellished with embroidery. Thai Chakri is one of eight styles of Thai national dress developed by Her Majesty between 1958 and 1964. So cool, right? To me,. this was the moment when Balmain was able to replicate the career of Hubert Givenchy, with his working relationship with Audrey Hepburn. Outside of fashion design, Balmain also launched the first perfume for Revlon in 1966, with the popular Miss Balmain. He opened his first store in New York in 1949 and, two years later, set up a company to create ready-to-wear looks. The fact of the matter is, despite Balmain's popularity and successes, his name has never been mentioned in the same breath as Chanel, Gres, Dior or Balenciaga. This was due to the fact that Balmain is often known as the commercial high fashion, despite the fact throughout his career, Balmain’s tailoring and his way with grand evening dresses were of the highest standard of workmanship.